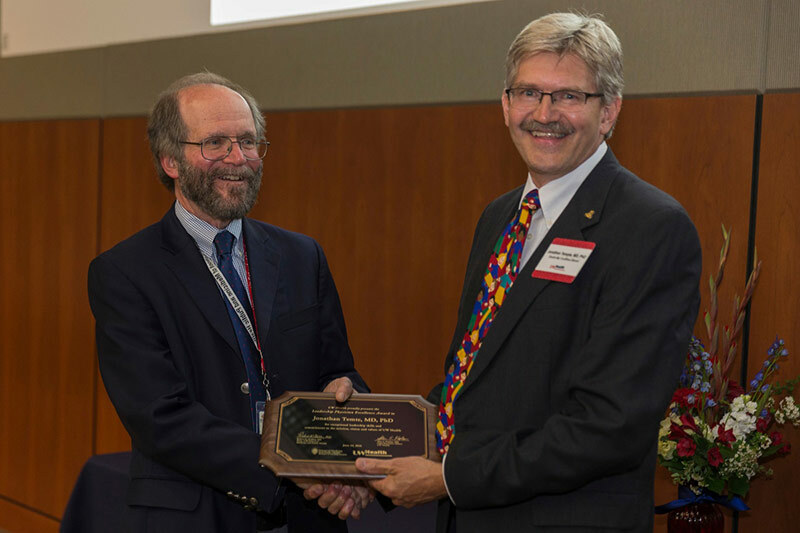 Jonathan Temte, MD, PhD, a professor (CHS) at the University of Wisconsin Department of Family Medicine and Community Health (DFMCH), received the Clinical Leadership Excellence Award at this year’s UW Health Physician Excellence Awards ceremony, held June 14, 2018, at the Health Sciences Learning Center. The award honors outstanding clinicians who demonstrate exceptional leadership skills outside of their home department as well as at an enterprise-wide level. Dr. Temte was recognized for living our system’s mission of advancing health without compromise through service, scholarship, science, and social responsibility as both clinician and researcher. As a family physician at the Access Community Health Centers Wingra Family Medical Center, he serves one of the most complex and diverse panels of patients in our system with compassion and great care. Nationally, his work has contributed substantially to improving the care of patients with respiratory and viral infections. His scholarship is outstanding, with over $5.5 million in competitive grants and over 65 refereed publications, the majority as first author. He is the principal investigator on four ongoing influenza studies in which he collaborates with the Wisconsin Department of Public Health and the State Lab of Hygiene. He was recently appointed by the CDC to serve on the Office of Infectious Diseases Board of Scientific Counselors, where his research and clinical interests helped guide federal and state policies in the treatment and control of communicable diseases. He previously served as the chair of the CDC’s Advisory Committee on Immunization Practices. Michelle Bryan, MD (Clinical Assistant Professor), Jessica Dalby, MD (Assistant Professor [CHS]) and William Heifner, MD (Clinical Assistant Professor) were honorees at this year’s UW Health Physician Excellence program. The program comprises peer-nominated awards recognizing those who demonstrate exceptional performance in clinical practice, education, leadership or regional services and a commitment to our mission, vision and values.